32 x 32 continuous face sheet MEMS device from Boston Micromachines - going in to ShaneAO as the high-order DM. 2 52-actuator magnetic-actuated membrane DMs from Alpao. One for the MCAO testbed, one going in to ShaneAO as the woofer (low-order) DM. Some number of 37-element segmented MEMS devices from Iris AO - for AO demonstration and laser beam wavefront correction. 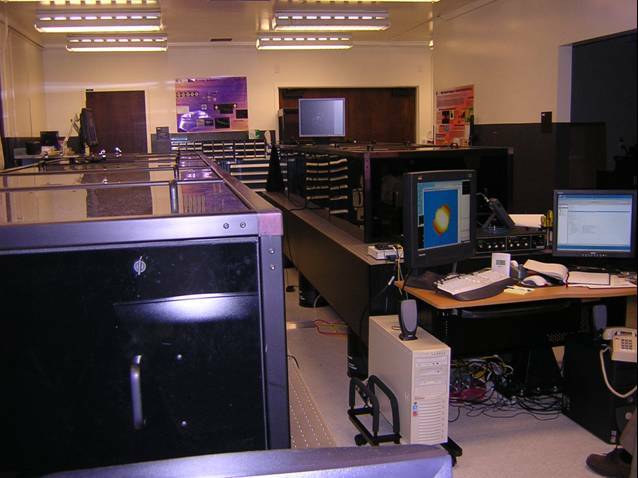 Laser Guidestar Uplink AO is an ongoing research effort at Lick Observatory. 2 Sci-Measure "Little-Joe" cameras with 80x80 Lincoln Labs CCD39 chip. One will be incorporated as the tip/tilt sensor on ShaneAO. 1 Sci-Measure "Big-Joe" camera with 160x160 Lincoln Labs CCD66 chip - to be incorporated as the wavefront sensor on ShaneAO. Etched glass 150 x 150 mm area with Kolmogorov spectrum, 40 micron features (4K x 4K), 8 bit resolution, 25 micron peak optical path difference - for testing ExAO or MCAO systems with simulated atmospheric turbulence - we only have 2 of these now but plan to replicate them at various peak optical path specification for use as simulated atmospheric layers. Acrylic spray on optical plastic. These are round 4 to 6 inch plates with a random pattern of aberrations roughly following a Kolmogorov power law. A 2-watt 532 nm short coherence laser for use in the PSDI interferometer. A 10 watt 589 nm Sodium Guidestar laser. Based on fiber-amplifier technology, this laser is adjustable in spectral and pulse format to enable optimal coupling to the sodium atoms. This is now in the LAO cleanroom in preparation for being installed at the Shane telescope in conjunction with the new Shane telescope adaptive optics system, ShaneAO. This laser was developed by a team at Lawrence Livermore National Laboratory under an R&D grant from the CfAO. Hardy Quad 3.04 Gigahertz CPU with 8 GBy RAM, 4 MBytes cache - for real-time MCAO tomography and wavefront control. 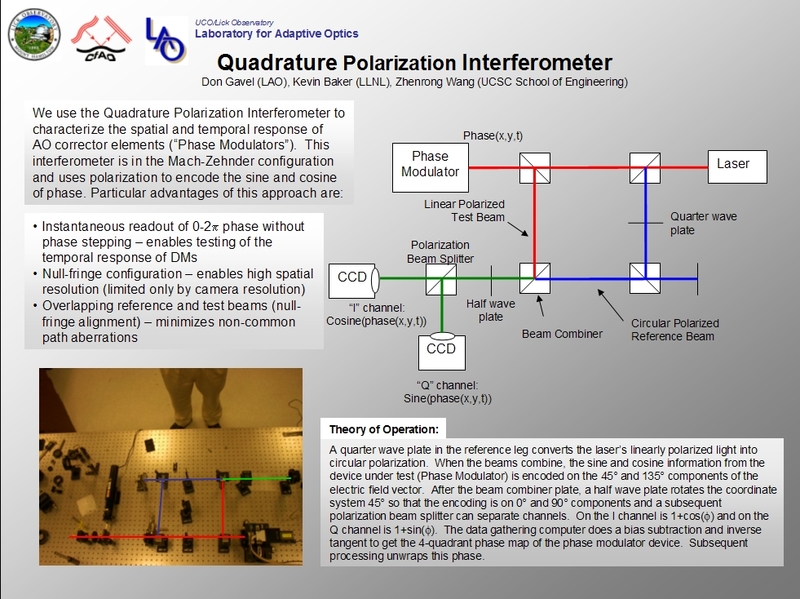 This is sufficient for 9 laser guidestars and 4 deformable mirrors with a 5 Hz control loop update rate. CPU idle time can be used for simulation runs. Lightwave A 24-processor compute server running Linux with IDL, Mathematica, Python, etc. - For running compute intensive AO-project related calculations such as Fresnel wave-propagation and laser guidestar sodium response physics.